This box contains all my calls, let's take a look inside. Predators responding to the sounds of the electronic caller usually come in from the downwind side. The profile doesn't really look like anything but the spotted fur and the dangling feather seem to hold their attention well. I try to sit within 50 yards of the call and always set up down wind. 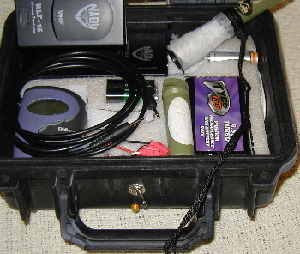 My call is housed in a Pelican 1200 case. The sound is carried out by a Speco 15 watt, 5" speaker mounted to the top of the box. 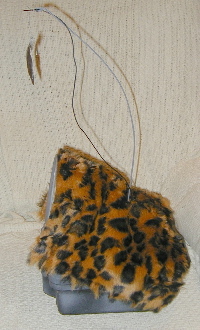 Spotted fur is Faux Fur. Insided we find the Nady 151 wireless microphone in the upper left. This transmits the sound for over 75 yards from my position to the call. The transmitter is powered by a 9 volt battery and the reciever is powered by a rechargeable 9.6 volt RC type battery pack. The Rio 600 MP3 player stores and playes the sounds. I also use a Critter Call (open reed) with a JS barrel and a Circe Jackrabbit closed reed call. Extra batteries are also kept warm and quiet inside the box. We hunt two basic types of country in Eastern Arizona. Rolling hills dotted with cedar trees and sage or rimrock of malapais or limestone with juniper, cedar and pinion trees. Both are very productive. When I leave the house I know where I'm going to call and already have 3 or 4 stands mentally picked out before the truck clears the driveway. The stands will all have 3 things in common; 1- High density of coyotes. 2- A good place to sit and see the area. 3- A natural barrier between the road and the call site to hide the outfit from sight and minimize the noise. Load up and we'll hit a couple of spots I really like. First stop is a mile wide flat with high grass and stunted cedars. Rimrocks surround the opening, covered with thick, bushy cedars. Rabbits abound, rats and mice are thick and coyotes compete for them. The seldom traveled road is a faint outline in week old snow and I'm worried about the noise of tires on crusty snow as we work slowly up to the flat. Stopping in a wash, the open is just over a little ridge. Opening the door brings a rush of sub-zero morning air and coyotes verbally assalting each other and screaming out threats that made me blush. One pack was off to the East where the sun's rays were shooting through the black night. The other group was further off and to the West. Let's slip inbetween them and give a little woodpecker and see what happens. It's useless to attempt total silence but sneaking the best way anyone could on frozen snow we creep into position. Plenty of things to go wrong on this stand. Wind is calm but trailing scent across the flat and the sun might come up and blind the eyes, concealing the incoming pack to the East. Fire it up amigo, well hope for the best. The wounded bird does it's job and 2 minutes later a pair is coming in from the East. They seem cautious and don't sell out like so many have over the past few months. At 75 yards they hang up and the scope is almost steady when they spook. Crap......what's up with them, scent is fine and I've moved slow... here they come back into view. Now they are over 300 yards and looking mighty small. This shot is makable though settle down and ......wait, they are looking back behind me....what's up with that?.........Slowly now take a look....Crap again, here come 3 big dogs and they are selling out. Turn quick and get the gun up, Don't let the lead dog hit your scent trail.....bark....louder.....BARK NOW......TOO LATE, he's done a 180 and his buddies are in his pocket......4" tall and 10' long screaming across the opening. Boom pops the trusty fowling piece but no fur will fly this day. Five dogs came and five dogs left......educated. Site Two- The sacaton and grama grass did well this summer, knee high across the rolling hills we're going to be calling. Get the hiking shoes on, it's 3/4 of a mile to the stand. We leave the truck with the call box and arrive appreciating it's light weight, this ain't no Johnny Stewart box. The cover is sparse, call box will sit right out in the open, you go hunker under that small cedar and I'll sit in front of this stump. We are looking at scattered cedars but down below is a cedar thicket. We'll call them out to us. Wind is perfect and still calm. This stand starts off with a little woodpecker action. Quiet at first, keep the sound level down. The woodpecker cries fade into silence just as the coyote appears. It is coming on in and when the sound stopps it puts another gear on covering the 300 yards quickly. I'm in the open, just camo between me and the dog but it doesn't notice. The sound didn't come from the burl on that stump, it was over there a ways. Afraid to move my eyes pegg in the corners trying to see if pard has seen the incoming.........there he is and his 22/250 is sittin' on ready. Mr. Coyote is now 15 yards in front of me, closer to me than the call or pard. He stops and looks past the call to the hunk of camo and walnut........Boom goes the Winchester and we notch the stock. Another coyote called, life is good. 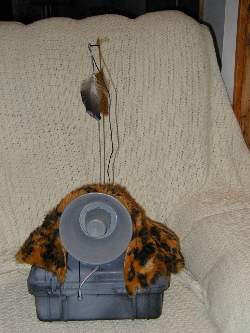 The sounds I have programed for coyote are 1- Woodpecker 2- Cottontail 3- Jackrabbit. I have had much success with these basic calls and use mouth calls to howl and mix things up.